Obtenga más información sobre la arquitectura única de la ciudad en el Art Nouveau Center. Our guide was Anita. She was a wonderful resource for lots of good information. Her command of the English language was excellent - her English was better than mine! She taught us much about the art nouveau art and architecture of the city. She tended to walk a bit faster than my wife and I would have preferred, but to her credit, she always looked back, and if we were lagging behind, she recognized this and waited for us. The tour was a very good value. Local and delicious treat with the group that was a nice bonus. Excellent tour with lots of information about art nouveau architecture. The guide was very knowledgeable and friendly. 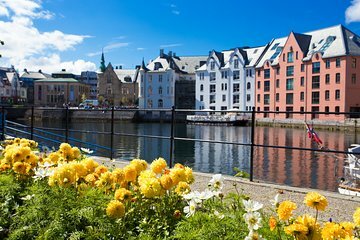 Wonderful way to learn history of Alesund. We were met right outside our ship by Anita who proceeded to guide us expertly through Alesund. It was amazing how knowedgeable she was and made the tour so interesting to us. Anita was personable, professional, friendly and helpful. She gave us additional guidance of what to do/see after our tour ended. Her personality made the tour extremely enjoyable. The hours passed by very quickly. And the treats she gave us were delicious! As soon as Left the ship we located the guide very easily. The tour was great and Anita was excellent! We spent the rest of the morning learning all about Alesund.